At Mercy Mounthawk, we have an active, committed and vibrant Parents Council. The Committee is elected annually in October from the general committee. The Parents Council meet in the school on a monthly basis and the Deputy Principal attends these meetings as an invited guest. All parents/guardians of pupils enrolled in the school are automatically members of the Parents’ Council . We actively encourage participation in our events and attendance at our meetings and are delighted to see new faces and to hear new perspectives at any stage of the school year. Meetings are held on the second Wednesday of the month in the school. Meetings commence at 8pm in Room 35 and last for approximately one hour. Our meetings are preceded from 7.30pm by an informal cup of tea/coffee and this is a wonderful opportunity to meet other parents in a casual and informal setting. Join us at any one of our meetings. You will receive a warm welcome. If you would like to make contact with us on any matter, email us at mmparentscouncil@gmail.com. Please note that Mercy Mounthawk Parents Council does not use social media accounts. Parents Council Christmas Bag Pack: Sincere thanks to the parents who generously gave of their time to help out at our recent Christmas bag pack, and who were ably assisted by our Transition Year students. We greatly appreciate the support offered by all who donated to our fund-raiser. Thanks also to Garvey’s Supervalu Tralee. All funds raised go to parent and student initiatives at the school. Information Talk: Stella O’Malley is a mental health professional, public speaker and bestselling author of ‘Cotton Wool Kids’, and ‘Bully-Proof Kids: Practical tools to help kids grow up confident, resilient and strong‘. Much of Stella’s counselling with parents and young people, and her writing, focuses on mental health and the importance of well-being, and she is a regular contributor to the Irish Independent and the Sunday Independent. We were delighted to continue our on-going support for the Well-Being Curriculum in the school by inviting Stella to speak with our second year students in early November. Later on the same day, over one hundred parents attended the Centenary Hall for a similar talk given by Stella. She described how difficult it is sometimes for young people to find a group they feel comfortable in – to find their ‘tribe’, as she described it. She focused on how our young people can tap into their inner strength to be deflect judgement and negative attention from peers. She invited the students to not be silent participants in bullying situations, to find their own voice in clever ways and to “Be an Upstander, not a Bystander” in such situations. The feedback on both talks was tremendously positive and both students and parents reported being encouraged and inspired by this talk. Careers Night for Senior Students: Making the transition to third level education is a challenging but rewarding time in a students life. Making the wrong choice of college course is the single biggest reason for students subsequently dropping out of College. In recent years, the Parents Council has placed a special focus on the needs of senior cycle students, as they examine the third level courses on offer and make decisions which will affect their futures. We were delighted to host our annual Careers Night for senior students on Thursday 4th October, with an attendance of almost 200 students from the 5th and 6th year classes. This event was established in 2015 and has grown in strength and success year-on-year. It offers a unique opportunity for the students to gain real insight into a variety of careers. We are very grateful to the many local people in industry and the professions who give so willingly of their time and expertise to explain their careers and to interact with our young people. Almost thirty career specialists volunteered to speak with the students about educational pathways, skills requirements, career challenges, pay structures and much more. Thank you also to the Transition year students and parent volunteers who facilitate this event. Guest Speaker – Cracking the College Code: We are also conscious of the important role parents play in supporting their children as they navigate these third level course decisions. We invited Catherine O’Connor to deliver a talk to parents on Careers Night. A renowned author, and Education Consultant at Trinity College Dublin, Catherine travelled from Dublin to deliver a very worthwhile and well-received talk on “Cracking the College Code”. This involves parents encouraging the student to take personal responsibility for their own lives and decisions, the student adequately researching course ideas, discussing openly with their son/daughter how it is proposed to finance college fees and maintenance costs, understanding the change to independent learning at third level, informing themselves in detail of all course requirements, taking on basic household chores, developing budgeting skills and much more. The parents challenge is to take a step back and encourage this independence. This is integral to the student not just surviving but thriving in college life. Parents’ Council AGM 2018: We commenced our year with the Annual General Meeting, which was held on Wednesday 26th September in the school’s Centenary Hall. At this meeting, we explain our involvement in the school through our activities, and we account for our finances for the previous year. This meeting is a great opportunity to hear about the many ways in which we carry out work on behalf of parents and students. The Principal, John O’Roarke, also gave a report at the AGM. This addressed recent changes in curriculum, use of new active learning methodologies in junior cycle, literacy and numeracy SIPs, academic achievements and aims for the coming year. Elections were held for Parent Representative positions on the Board of Management. Second Chance Uniform: Before the new school year began, we were busy working on behalf of parents – in mid-August, we hosted a sale of second chance uniforms. This is made possible by the generous donations of no longer needed items of uniform, which we wash and offer for sale at very affordable prices. This is also a significant fund-raiser for the Parents Council so we appreciate your support for this initiative. Our next sale will take place in January, but if you need a replacement or spare sweater / trousers / tie at any time, contact us at mmparentscouncil@gmail.com and we will arrange to meet you. Family Table Quiz: Our Table Quiz fund-raiser was held in the Centenary Hall on the evening of Thursday 8th March and was a resounding success in many ways. With a phenomenal turnout of students, parents and guardians, it was a fitting tribute to the celebration of Family Week in the school, where students and parents were encouraged to set aside mobile phones and technology and to engage in spending quality-time together. MC Sean Lyons brought his own inimitable brand of humour to the proceedings and we are grateful to Sean and also to the many local businesses which generously donated spot prizes. Proceeds from the event will be used to support the development of the new computer science facilities. Information Talk – Substance Abuse, a Parents Guide: Each year the Parents Council do our best to host an educational talk on a topic of interest to our parents. This term, we decided to shine the light on substance abuse, exploring the local experience of misuse of items which commonly exist in homes – alcohol, tobacco, prescription medication – and also the misuse of substances such as cannabis, solvents and class A drugs. We were delighted to welcome a member of the Kerry Drugs Unit of An Garda Siochana for a Parents Guide to Substance Abuse. 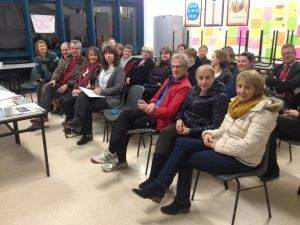 A substantial number of parents braved the elements to join us on a wet and cold November evening, an indication perhaps of the concern of the challenges facing our young people, their parents and our community. We are extremely grateful to our local Gardai for facilitating this event. This section will carry links to any current consultations being undertaken with parents in the school regarding policies or procedures. While one of the primary aims of the Council is to inform parents/guardians about our childrens’ education, we also encourage parental engagement through involvement in some (not all!) of the following activities which we have initiated over the course of recent years. These activities have been integral to the development of a positive and rewarding relationship with the school. Educational Courses and Talks for parents. Fund raisers – bag-packing and table quizzes. Book Scheme which makes second-hand books available to some students. Supporting public speaking sessions for students. New items of uniform are readily available from Gemma’s Uniforms, who attend the school regularly. They are also available from Fitzgerald’s store, located on The Mall in the centre of Tralee town. Recognising that new uniforms can be expensive, we have setup this scheme to offer previously owned items of uniform for sale at affordable prices. We hold two sales of Second Chance Uniforms each year – in late August and in early January. However, if your son/daughter needs to replace an item of uniform during the year, contact us as we may have a suitable replacement in our stock. Donations of good quality, previously-owned uniforms can be left into the school office for the attention of the Parents’ Council.